Homer arrived quite unexpectedly at Rev. Marjorie Davis's home in early April. He was a fluffy little thing, cute and cuddly, in need of a home -- but what was she to do with Homer? How could she help him? Marj is hardly what I would call a retired UCC minister. She's always working on some project, attending a workshop, or advocating a just cause. 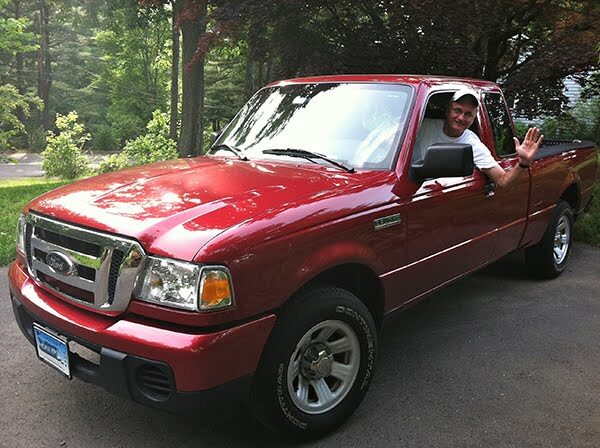 She's a good friend to all who know her here in Granby, CT. Like many in town, I have a shared passion with Marj. Ours is Habitat for Humanity -- she's a long-time Habitat advocate and donor. I fondly recall her participation in Hartford Habitat's House of Faith groundbreaking at the corner of the city's Case and Laurel Streets (Marj's parents, Swedish immigrants, once lived on Laurel). Habitat's House of Faith program is an interfaith collaboration where multiple faiths work side-by-side to build a new Habitat house. 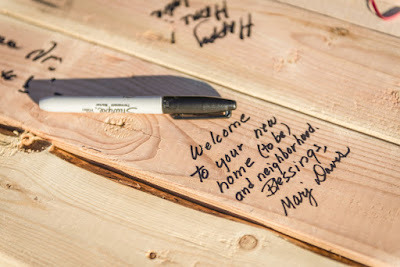 During the ceremony's traditional board signing she inscribed her welcome and blessing to the new homeowners-to-be on one of the two-by-fours designated for the home's first wall. I have displayed a picture of it on my computer screen for inspiration ever since. But Marj's question remained -- what to do with Homer? His arrival was a surprise. Would her home be the best place for him? He's awfully cute but, you see, Homer is a stuffed animal -- a puppy with the words Habitat for Humanity displayed on a bright green collar. Marj wondered if Homer would be better suited for a young child. It turns out Habitat for Humanity International sent Homer Marj's way as a thank you memento for her recent donation. "Do you know someone who might like Homer?" "Yes." "Does the family in the new Granby Habitat home have children?" "Yes." "Do they have a young child?" "Yes, her name is Shelby. She's eight years old"
"Would she like Homer?" "I think so." "Would you be a able to deliver him?" "Yes." I had been meaning to pay Ralph and Jaime Wyman a visit to see how they were settling in to their new Habitat house so Homer's arrival proved fortuitous. 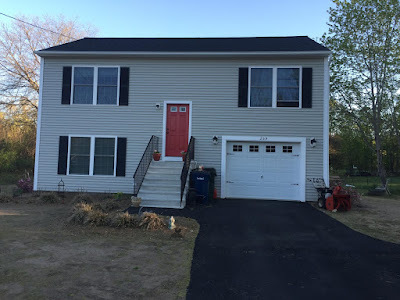 Soon I was at the front door of Wyman's West Granby home -- a home that they moved into just in time for Christmas four months earlier. Shelby was away on a playdate when I visited, but Jaime and Ralph assured me Shelby would be thrilled with Homer -- just as they all are thrilled with their new home. Some school teachers had told me Shelby was a chatterbox who couldn't contain her excitement about moving in to her Habitat house while it was nearing completion last fall. 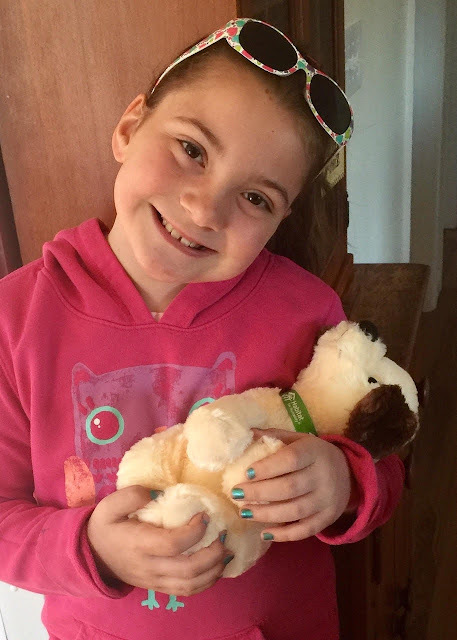 When she returned home and saw Homer waiting to greet her, Shelby jumped with joy. So thrilled that she immediately wrote Marj a thank you note, and just as quickly dropped it in the mail at the post office across the street. 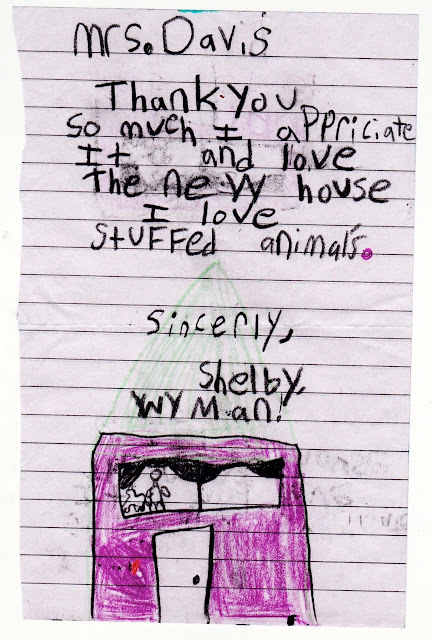 Shelby's charming note included a drawing of her new home in which she and Homer are looking out the front window enjoying the view of their brand new world. Photo of Marj's Signed Welcome by Don Shaw, Jr. So good to know the family in the W. Granby house are happy with their new house. Would love to meet Marj Davis and Shelby some day.